Brain Rules came to me highly recommended. When I finally picked it up, I had completely forgotten what it was about. As I read through it, I became more and more excited about how I could incorporate what I was reading into my life. It was so compelling, I ended up finishing it in about a day and a half. The initial rules are about how exercise and sleep can improve brain function, and virtually every other aspect of your life. In the last few months, I had decided independently that I would try to get more of both of these. I’ve been exercising regularly and trying to get eight hours of sleep every night. Along comes Brain Rules and tells me I’m a genius! I knew it! Although not all of the rules are as compelling as these, they are all thought-provoking and applicable in some part of your life. One section I found particularly compelling regarded how boys interact with each other. Not only do I have two sons, but I also coach a boy’s baseball team. I realized that I had seen the ways boys interact first hand every day for years. Not only that, some of what I thought was “bad behavior” is really just their way of setting the social order. 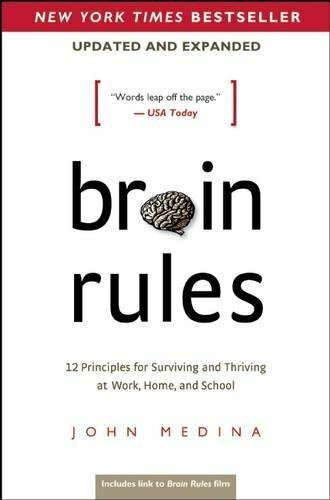 Just in case that’s not enough to encourage you to check this book out, here’s a list of the twelve brain rules. I bet you find something you’re interested in. Survival – The human brain evolved, too. Exercise – Exercise boosts brain power. Sleep – Sleep well, think well. Stress – Stressed brains don’t learn the same way. Memory – Repeat to remember. Sensory Integration – Stimulate more of the sense. Vision – Vision trumps all other senses. Music – Study or listen to boost cognition. Gender – Male and female brains are different. Exploration – We are powerful and natural explorers.